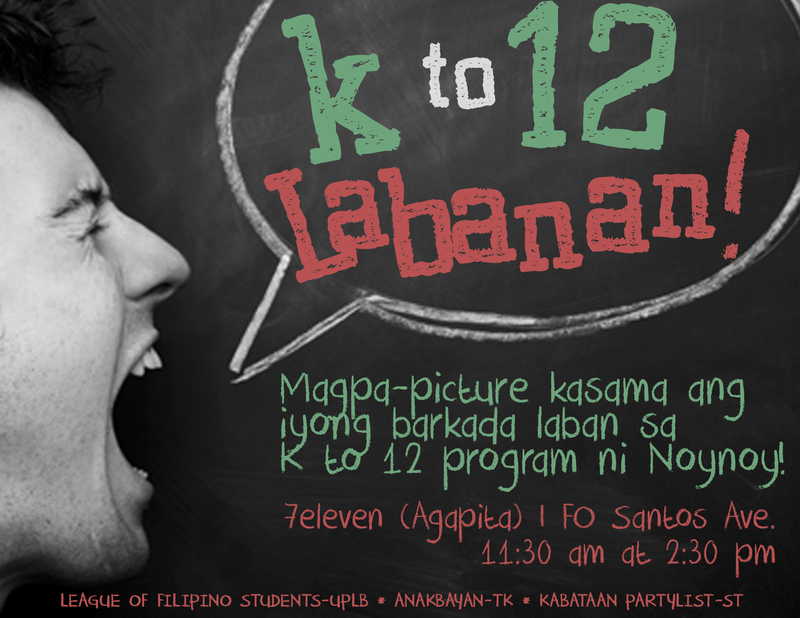 Labanan ang anti-mamamayan at maka-dayuhang K to 12 program ni Aquino! by ANAKBAYAN on April 14, 2012 10:30 am. Click here to go to original post. The recent spate of human rights violations against youth and student activists has alarmed a national youth group, saying that the violations are part of the Aquino administration’s drive to clamp down on the intensifying criticism and disillusionment against it. According to the youth group Anakbayan, 22 youths and students have fallen victim to various human rights violations at the hands of military personnel in the first 14 weeks of the year. The most recent three are all members of the said organization: Christian Tuayon, chairperson of Anakbayan’s chapter in Negros, was arrested last April 3 after trumped-up charges of robbery were filed against him by the military. Cleve Arguelles and Nikki Gamara, both students of the University of the Philippines Manila, were subjected to surveillance and harassment by suspected military agents on April 2 and 3. Gamara is the daughter of Reynante Gamara, a Bayan Muna campaigner and urban poor-workers’ organizer, who was arrested on the same day as Tuayon. “The military cannot deny its hand behind these attacks and harassments. As I learnt from my personal experience, the AFP has a ‘With Us or Against Us’ mindset. Anyone critical of the government and the status quo are immediately viewed as ‘subversives’ or ‘enemies of the state’” said Anton Dulce, national vice chairperson of Anakbayan, himself a victim of military abuse. The youth leader is a member of the ‘Porac 3’: three students of the University of the Philippines Diliman who were verbally and physically abused by the military while the former were conducting their course’s practicum at an Aeta community in Porac, Pampanga. 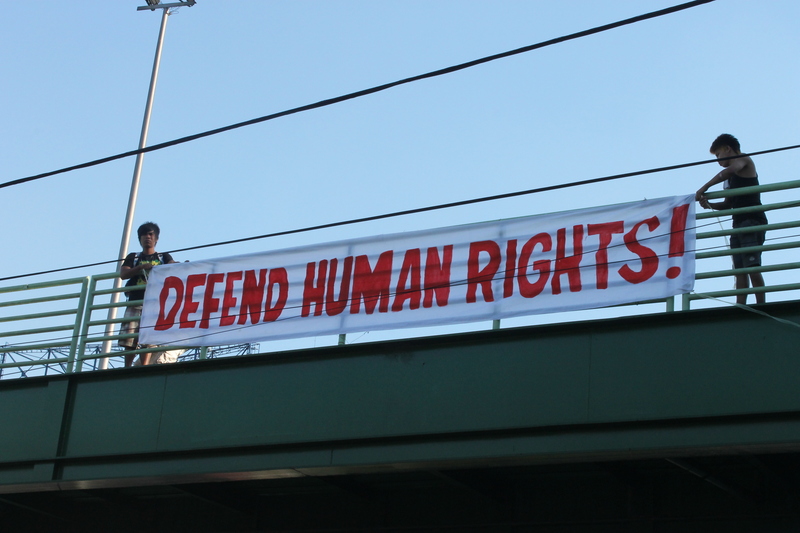 “But more importantly, even the government’s courts have linked the military with human rights violations, as in the case of retired general Jovito Palparan” he said. The Army officer was charged last December by the Court of Appeals with the abduction and enforced disappearance of UP students Karen Empeño and Sherlyn Cadapan last June 2006 in Hagonoy, Bulacan. He has also been accused with hundreds of other cases of extra-judicial killings and enforced disappearances in Mindoro, Samar, and the entire Central Luzon region. “The attacks are all part of the Aquino administration’s plan to halt the rising tide of disgust of the Filipino people against it. The military is hoping that it can silence one of the more critical, vocal, and active sectors of our society” said Dulce. Youth and student groups such as Anakbayan have been at the forefront of protests against various programs and policies of the Aquino administration. They led the ‘student strikes’ against budget cuts to education and other social services in 2010 and 2011, the first-ever large-scale protests under the reign of President Benigno Simeon ‘Noynoy’ Aquino III. Recently, members of Anakbayan invented ‘Noynoying’, a form of protest which depicted Aquino’s inaction on important national concerns, and one which quickly became popular worldwide. 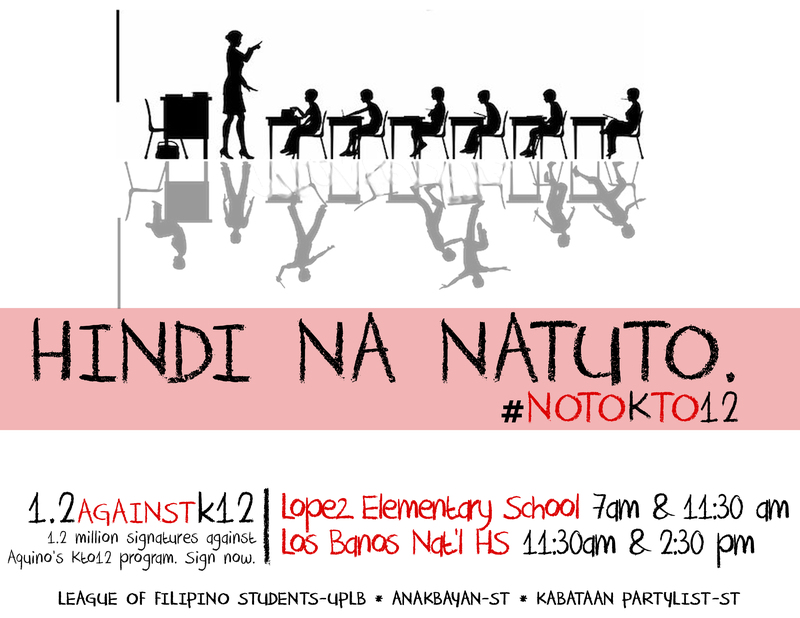 The national youth group Anakbayan is urging Ombudsman Conchita Carpio-Morales to prioritize and take action on the 2004 Hacienda Luisita massacre in which seven farm workers and supporters were killed after soldiers opened fire on them. “This is a chance for the Office of the Ombudsman to make amends and correct a very grievous injustice committed against the farm workers of Luisita” said Vencer Crisosotmo, national chairperson of Anakbayan. According him, Carpio-Morales’ successor, Merceditas Guiterrez, sat on the case’ during her entire six-year term. On November 6, 2004, more than five thousand farm workers went on strike to protest, among others, the illegal firing of their union officials and the infamous Stock Distribution Option (SDO). They were accompanied by residents of the ten baranggays inside Luisita, sympathetic baranggay officials, priests, and even people from other parts of Luzon. Ten days after, soldiers used an armored personnel carrier (APC) to ram through the strikers’ picket line and then opened fire with more than a thousand rounds of ammunition. The seven are: Jhavie Basilio, 20 years old; Juancho Sanchez, 20; Adriano Caballero, Jr., 23; Jhune David, 27; Jesus Laza, Jessie Valdez, and Jaime Pastidio. Six more were killed, said the farm workers, but their bodies were never recovered. In addition, 121 were injured, including 11 children and four aged above sixty years old. Until today however, not a single government or military official has been charged in connection with the massacre. Among those being held by the farm workers’ unions as liable for the massacre are: former president and Armed Forces commander-in-chief Gloria Macapagal-Arroyo, former labor secretary Patricia Sto. Tomas, former armed forces chief Hermogenes Esperon, former police chief Edgardo Aglipay, and the Cojuangco-Aquinos. “We hope that the Ombudsman will do its job despite the clear conflict with the interests of the presidential family” said Crisostomo. Despite repeated claims by the Palace that President Benigno ‘Noynoy’ Aquino III has divested his share in Hacienda Luisita, Anakbayan has maintained that Aquino is still responsible for any developments (or lack of) in issues surrounding the Tarlac estate as the head of the government.